This month, I was honored as a recipient of an Influential Women in Business for Volusia and Flagler County. My background is in radio and getting interviewed without it being a email question and answer format makes me physically sick. Why you ask? Bet you never volunteered to fill out a police report for a stolen Spring Break Promotional Item and was in the same said paper the very next day with the title "Girl Reports 25 Foot Condom Stolen". This was a shining day in my daddy's eyes. Let me tell you. So, to say I have been grossly misinterpreted is an understatement. Last year, I was nominated as well , but the picture looked like I had JAUNDICE, my name and business were MISSPELLED throughout and although I was honored, I just chalked it up to another the Lord giveth and the Lord taketh away episode in my life. So when the lovely Daytona Beach News Journal reporter Fatima called, I was sweating. She actually did a great, accurate job! Besides a little hard on myself cringing moments, and a don't print that declarations-I think I sound like an alright chick! I posted the article below from my business website with some sprinkles of bolded footnotes to set the record a little straighter, off the record-of course. FIRST JOB: Fashion buyer for Belk department store, age 15 JUNIOR DEPARTMENT fashion buyer, big difference but it makes me feel like a teenage Anna Wintour so there is that! COMMUNITY INVOLVEMENT: President-elect, Junior League of Daytona Beach, a couple of other wonderful things and organizations I contribute to but this is my focus this year, and no one likes a bragger of a girl who has absolutely no idea how to sit on her hands. FAMILY: Husband, Steve Tacinelli My husband thanked me for not including the cats, although they were omitted in the part of the interview when I claimed that they worked with me in the accounting department. What started as a hobby eventually be­came a full-time job for Darlynn Tacinelli. Tacinelli, who owns and operates Little Blog Dress Media, started the Ormond Beach company as a blog for female NASCAR race fans who weren’t “conventional” race fans. This means that our friends work in the sport, we love it and own a bra and have a dentist. I asked her not to print that and she complied. “It really just started for fun between my girlfriends and I ,” Tacinelli said. “But we began to think about how we could make money off of the website,” adding that the concept of building a social media manage­ment business was born. Yes, Yes all factual. 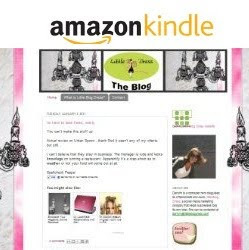 Little Blog Dress provides social media set­up and management services for companies, as well as creating blogs and websites. “It really started at the right time because social media management wasn’t really pop­ular at the time,” Tacinelli said. Correct, check. A lifelong Ormond Beach resident, Taci­nelli said Little Blog Dress is modeled after the black dress Audrey Hepburn wore in the 1961 film, “Breakfast at Tiffany’s.” Ooof the word logo could have helped this makes me sound a wee bit better. My logo was modeled after the movie, not my business. Little Blog Dress has been featured on national websites such as MSN Living and Jayski, an ESPN partner site, dedicated to NASCAR coverage. This makes me sound way more cooler than I am, I submit and they have picked me up about a dozen times. Still true tho! “I can’t believe this is my life. I’m so, so lucky,” she said. I must have uttered this at some point, because it is so very very true. Thanks Fatima, call me anytime you made me sound like a rockstar!